But what if not all artifacts are created equal? What if specific artifacts enable the identification of attackers’ activities quicker and more accurately? This article discusses two artifacts we’ve identified as being significantly helpful when solving incidents: command prompt history and console output. To contextualize the scenario, we developed an automatic system that collects real-time forensic information from compromised machines. The collection and analysis of such information is called "Live Response." The goal of this process is to identify and analyze the incident's trigger as quickly as possible. In Live Response, investigators capture volatile information that would not normally be present in a postmortem investigation. It can be difficult to remotely access and run code on the compromised machine. It can be difficult to remain unnoticed by the attacker; the information-gathering process must be quick and stealthy. A SANS Institute whitepaper lists examples of commonly collected artifacts in Live Response. These include running processes, running services, current login information, open files, open shares, open handles, and so on. While building the forensic collection tool, we identified several artifacts beyond those in the whitepaper’s list. As we’ve learned through investigating a wide range of attacks, it is common for attackers to use consoles (for example, Windows Command Prompt) to execute native commands as well as malicious code written in PowerShell, Python, and other scripting languages. This makes command-line history and console output extremely valuable when examining compromised machines. Let’s examine how these artifacts can be retrieved without dumping memory or performing code injections. 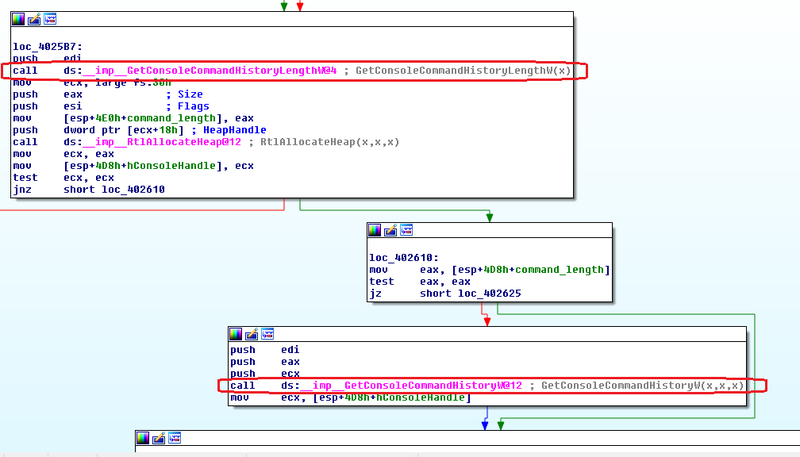 The command history of an attacker’s console is extremely valuable in Live Response. Unlike the Linux shell (which stores command history in a file on disk, making the task of fetching command history trivial), Windows Command Prompt history resides only in memory. The only native Windows option to retrieve command history is Doskey.exe. From host memory, Doskey retrieves all commands executed on a cmd.exe console (see example below). Doskey’s major limitation is that it is called from a Command Prompt session and can only retrieve commands executed during that session. For example, calling Doskey from cmd.exe (PID 1337) can retrieve only the history of cmd.exe (PID 1337). As Doskey cannot retrieve the Command Prompt history of an external console, it can’t be used as a Live Response tool. It is worth mentioning that the Volatility Framework offers a useful plugin called cmdscan. The cmdscan plugin searches process memory (csrss.exe or conhost.exe, depending on OS version) for commands executed via a console. Unfortunately, as with all volatility plugins, it requires a memory dump as input. As memory-dump creation requires a unique tool, is labor-intensive, and takes time, cmdscan cannot be used as part of Live Response. Our goal is to retrieve the commands an attacker has executed while the attack is underway. Having no luck finding a native solution, we decided to dive into the task ourselves. GetConsoleCommandHistoryLengthW - retrieves the buffer size of the Command Prompt history, and expects a console process’s name as input. GetConsoleCommandHistoryW - retrieves Command Prompt history as a null-delimited buffer of strings, and expects the buffer size and process name as input. 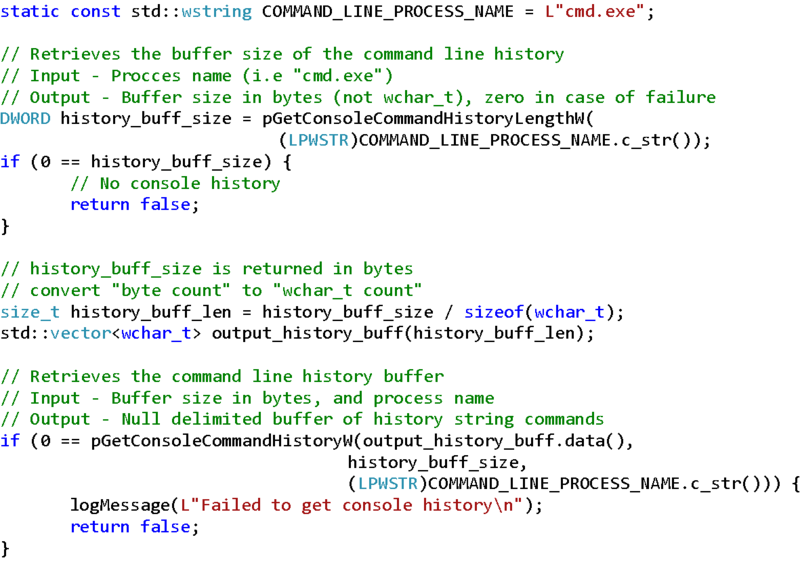 After execution of GetConsoleCommandHistoryW, output_history_buff holds a null-delimited buffer with the Command Prompt’s entire command history. GetConsoleHistoryInfo - retrieves the history settings of the calling process's console. The function’s MSDN page states that if the calling process is not a console process, the function fails and sets the last error to ERROR_ACCESS_DENIED. These APIs should be executed prior to GetConsoleCommandHistoryLengthW and GetConsoleCommandHistoryW. The ability to retrieve the Command Prompt history of cmd.exe using AttachConsole fueled our greed; we also wanted to see the entire console output buffer, which includes not only the attacker’s executed commands but the commands’ output as well. Surprisingly, this was simpler than retrieving command history. Once the application is ‘attached’ to the attacker’s console, the Windows GetStdHandle API obtains a handle to the specified standard input, output, or error. In this case, the STD_OUTPUT_HANDLE was used to obtain a handle to the standard output. 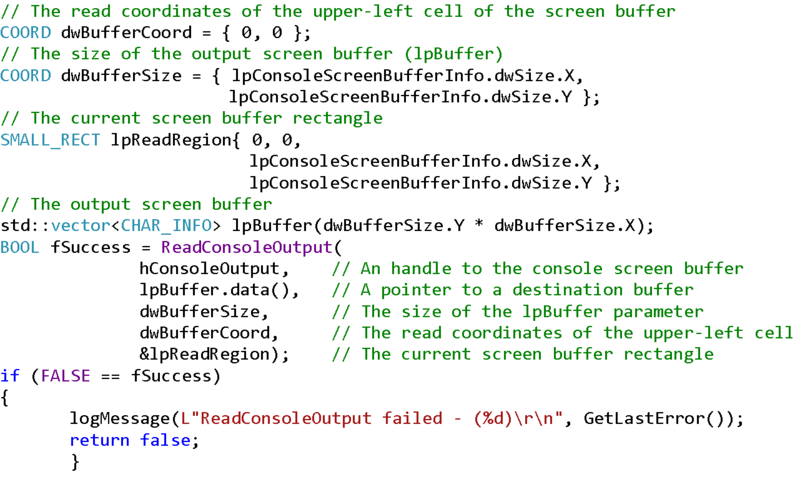 The next phase is to retrieve information about the process's console screen buffer using the Windows GetConsoleScreenBufferInfo API. The API returns the screen buffer's attributes in the CONSOLE_SCREEN_BUFFER_INFO structure.  This information is used in order to read data of the right size from the console buffer. The final stage is to read the console's output with the Windows ReadConsoleOutput API. 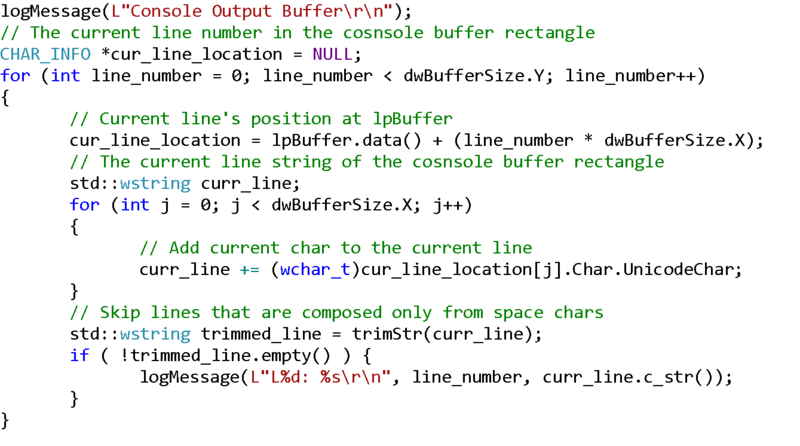 The function retrieves a two-dimensional array of CHAR_INFO values that represent the screen buffer. Running the above code on the following console’s PID generated the output below. The same code can be used to retrieve the output on any kind of console, including PowerShell and Python. Live Response can be used to resolve incidents quickly and efficiently. Of the artifacts collected, some can provide more value to IR analysts than others. We concluded that the Command Prompt’s history and console output are highly valuable. We therefore recommend that more analysts start to collect them as part of forensic investigations. There may be additional evidence that help in Live Response investigations, and the community should be encouraged to share any other relevant information. 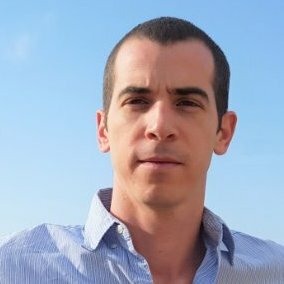 Source code is available at the IllusiveNetworks-Labs GitHub. *Update – On September 1, 2017, FireEye released a great two-part blog called “Monitoring Windows Console Activity”. In the blog, they review the concept of using a filter driver to capture console input and output on a Windows 8 and later systems.